Being a blogger who lives in a mobile home, I tend to get a lot of mobile home related emails and questions about renovating them. I don’t particularly write this blog for mobile home folks per say, I try to share my ideas on how to make the most of whatever home you have. While we could easily afford a real house, it wouldn’t be in the same place where I live now, and there’s no place on earth I’d rather live. So we just make the most of what we have and do our best to bring our vision of home to life. With all that said, I still get those questions. If you’ve never lived in a mobile home, there’s one thing that we all hate – those darn strips on mobile home walls that they use to hide the cracks in the drywall. Mobile homes are made with pre-wallpapered dry wall, then matching strips are made to hide the gaps, because they’re made as quickly and cheaply as possible. Plus moving a house creates all kinds of problems, so this also helps to eliminate cracking of dry wall compound in said joints. I hate those strips. And I know that tons of others do, too, because I get emails about what to do all the time. 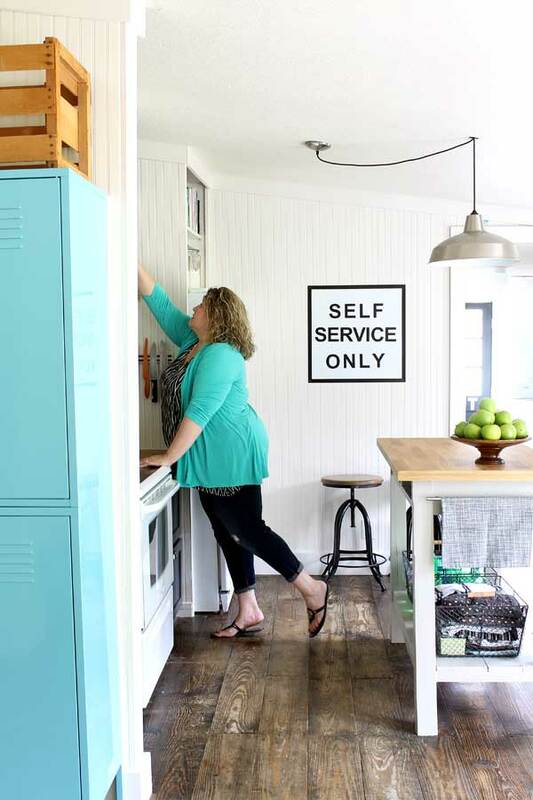 So today I’m sharing the three ways we recovered our mobile home walls to get rid of the mobile home look. 1) Bead board: Let’s start with what we use the most: bead board walls. We have covered about 75% of the walls in our house with ply bead, and I’ve shared before how we install bead board walls. It’s not the cheapest option, but it is my favorite. Because mobile homes don’t have a lot of character, this adds tons of it. Plus they help insulate better and sound proof, both of which are issues mobile home owners have issues with. It costs on average about $600 per room to do this – but if you think about the energy savings from the additional protection of the walls, it’s really worth it. Plus, let’s face it – it’s pretty. I’m all about some pretty. 2) Corrugated Metal: In our laundry room, we kind of ran out of budget, but found a KILLER deal on some metal roofing, so we installed it on one wall. The whole wall was less than $40 to do (including trim), and it went up faster than bead board. On top of that, it doesn’t need to be painted. Can you say win/win? I’m sure there’s probably eleven million other ways to cover walls without breaking the bank, these ideas are ones I’ve actually used and can tell you with experience that they work. Do you have to live in a mobile home to use them? Absolutely not! If you’re looking to add a little something extra to a space, wall coverings can go a long way, baby! Thanks for sharing this. My parents recently downsized and moved into a 55+ park. When they started looking, their biggest concern was the ‘seamed’ walls. They hired people to come in and install beefier moldings and repaint the interior. It made a huge difference and they are now happily settled into their new ‘seamless’home’. 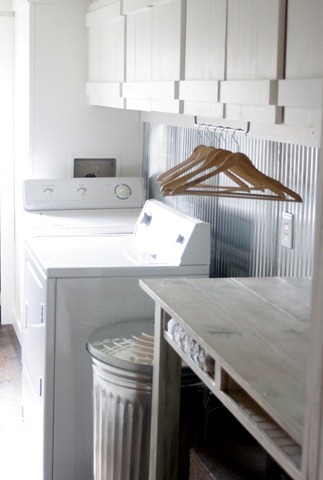 Love your bead board walls and using the corrugated metal in your laundry room is such a cool idea. i seriously wish we lived closer! Me, too, my friend, me, too! I love everything you do:) Great ideas!! I LOVE your blog and your style! However, I have to make one small correction to your sentence: “While we could easily afford a real house, it wouldn’t be in the same place where I live now, and there’s no place on earth I’d rather live.” I also live in a mobile home, and it is very much a “real” house. So many times I’ve been asked if I wouldn’t prefer a “real” house and always correct people on this. I never tell people I live in a mobile home; not because I’m ashamed, but because I don’t feel the need to have to explain my house any more than someone who lives in a log house, a cinder block house, etc. Okay….I’m off my soapbox now!! Your home is beautiful and you have so much to be proud of! Susan, I whole-heartedly agree – but it’s hard to get across my point without using terms that most folks use every day. I’m not ashamed of where we live – I love it! It’s a real HOME for us, which is the point. Sorry if it came across in a wonky way, I just wanted to let you know that I completely understand where you’re coming from. We are going to remodel our bathroom and we live in a 1984 mobile home (yes it’s an old one). However, is it hard to do the peel and stick on the walls and floor? Hey Melissa, we did not do any peel and stick on our walls or floors, we covered them. We installed pine wood floors right over the sub boards and we put beadboard over most of our walls, and some wood planks for a shiplap look in our bedroom. We put up corrugated metal in our laundry room. I can’t tell you whether peel and stick will work or not, we love all of the ways we have covered our walls and floors and they have held up beautifully. Good luck on your remodel!! Peel and stick is terrible. Fighting that now. Trying to find budget friendly fixes. I’m so glad you said that, I also live in a mobile home, and am very proud of myself that i could buy it. There are some great ideas and things to with our homes. I’d love to hear of things i could do with my house. I appreciated these comments. We are considering leaving our “real” home to move closer to the family farm. If we can sell our property, we will be purchasing a mobile. It’s a big change if it happens. We’ll be taking 3 kids from a house with a basement to a 1 level home without the second living room. But I think that we can make it into something we can be proud of. It’s all about what’s important. That is family! I just did the same thing. I sold my “real” home, two story, 4 BR, 2 bath, 2 car garage, super large privacy fenced yard with 33 ft. pool, and bought a mobile. It was the best move ever. I only lost about 100 sq.ft. of living space on paper, but actually utilize all of the space I have now, as opposed to wasting some of it before. I live out in the country, on 4 beautiful tree lined acres, lots of wildlife and peace. No more steps to climb, no second story to clean, open concept “home”. Most mobile homes have 2 living rooms. My double wide does. I feel it is kinda of a wasted space because we don’t use it much. I LOVE my house!!! I am happy to hear you say it is a “real” home because that is the way we feel. When I moved to TN from hot, crowded Ft. Lauderdale, I wanted space. I have big furniture and the other homes we looked at in our price range were cute but way too small. We wanted some land and no close neighbors – we also wanted a big space for our dogs to play when they are outside (we have 5). When we walked into this house, it was beautiful. It is 2 years old and sits on almost 3/12 acres – it met every requirement I had. The decor was awful but it was immaculate and paint is easy. One end of our “manufactured home” – that is what they call it, in the living room, has about 2 feet of empty space between the outside wall and the inside wall – there were two indented places on the inside wall for a bookshelf and a huge TV . When the TV died, my son made that space much smaller but there is still so much heat coming from that wall because it is on the southwest end of the house. We actually had to add a window AC in a dining room window. We have done hardwood floors (wish I knew about Gina’s pine floors back then) but want to do something to help insulate and also to cover those strips. Love Gina’s tips and all of your suggestions and replies. Time to go to Home Depot! Carol and Susan, you both rock!! Amen Susan…I have always lived in a conventional home. Last one was a beautiful 2 story builders model. My husband’s cancer used up pretty much of 47 years of savings. So I sold my 2 story, as I couldn’t maintain it and moved to Ga, bought 17 acres near my family. To stay within the amount of money from the sale of home and after development costs, I opted for a new custom built Fleetwood dbl wide. It is 2100 square feet and absolutely beautiful. I moved in , in 2017 and couldn’t be happier. My taxes went from 6000.00 a year to 350.00 ( with all my exemptions being a senior) plus no outrageous HOA fees. Everyone who comes in my home are in awe… literally! But, I too…like you simply call it my home. I find no reason to say I live in a mobile home, which people still refer to as a ‘trailer’ ! When we lived in Florida, I never called my home a block home, which almost every home is in Florida. My mobile home wasn’t cheap and the county I moved into put so many regulations on it…as I had to have it manufactured with a 5-12 pitch roof instead of a standard 3-12…which cost an additional 8,000.00 . I am literally IN LOVE with this home, it has soooo much character. You and your home are just darling! I also live in a mobile home…No mortgage and I’ll continue to ignore those strips. I just paint and cover everything. I have changed out some of the moulding near the ceiling, but generally that gets painted also. I have to tackle painting the kitchen walls and ceiling now that I have had new cabinets made and installed. I added a fireplace surround in the living room because mine was on an angel and the face was flat (and boring) I love to decorate and a mantle is definitely a must have. Love your blog! Can you post a picture of the mantel? I shared your blog with a facebook group of DIY decorators/organizers. I personally love your clean, airy look and hopefully they will come visit and be inspired. I love this post! Really shows you can do anything with creativity! 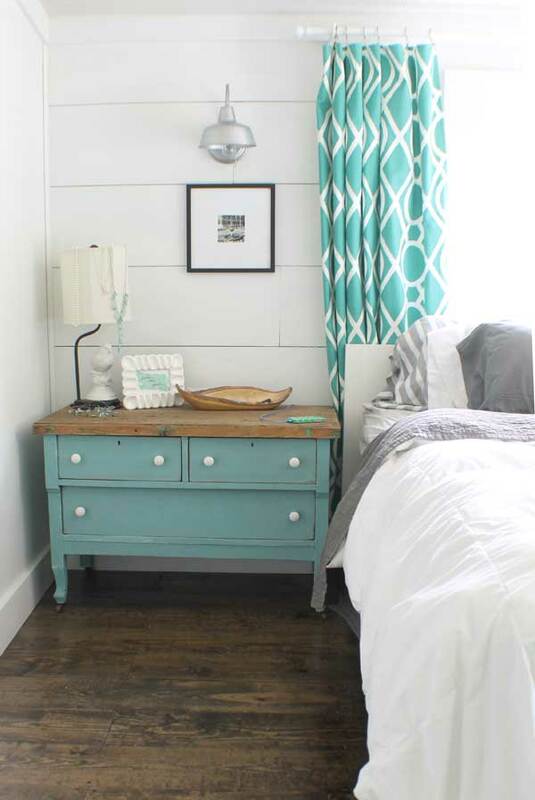 Recently found your blog and I love it and your home! Very inspiring. covering that up??! I love your blog, I am new to it and am excited to see what’s next. I agree with you Nancy, I still look still look at that paneling in the home that I bought a few years ago. I have a few wallpaper walls that need to be redone or completely changed. Love my kitchen/dining room which is the best but once again the walls and cabinets need some help. It’s definitely home though and it’s mine. One step at a time and one day at a time and we will have it the way we want. (My husband and 2 small dogs live here). My husband grew up living in a double wide and he always tells me when our boys are out of the house we are moving to a 55+ community living in a double wide. His dream is to not have a house payment and not to worry about taking care of much land. I was hesitant to his idea because when I was younger I had several friends who lived in trailers and I remember their moms trying to hide the seams you are talking about. I remember my one girlfriends house like it was yesterday and her mom hung wallpaper but unfortunately you could still see the metal strips. To bad you weren’t around then with all of your wonderful ideas. Love your blog and I love your Real house. You have really transformed it into a show stopping home for you and your family. When I reconnected with my 1963-64 high school sweetheart four years ago, we started looking for a house together. Eighteen months ago, we bought a1986 1,692sf manufactured home with a 3-car garage on a half acre. First thing we did was to get a dumpster and pull out all of the plumbing fixtures and cabinetry. Dave (with construction experience) and two guys completely re-sheetrocked the entire house…walls AND ceilings. I was never so glad to get rid of seams…and brown wallpaper. We’re about 90% done with the two bathrooms, the kitchen, the dining room, the utility room, and the bedroom (we just moved into the bedroom a couple weeks ago). The two smaller bedrooms will be our respective offices and the big room in the middle will be the library and the living room. Our goal is to pay off the 30-year trust deed in eight years. We bought the house for $61,310 and the county assessor just reassessed it to about $104,000 (he hasn’t seen the inside and we don’t plan on inviting him). Thanks for sharing, I enjoyed looking at your great ideas! 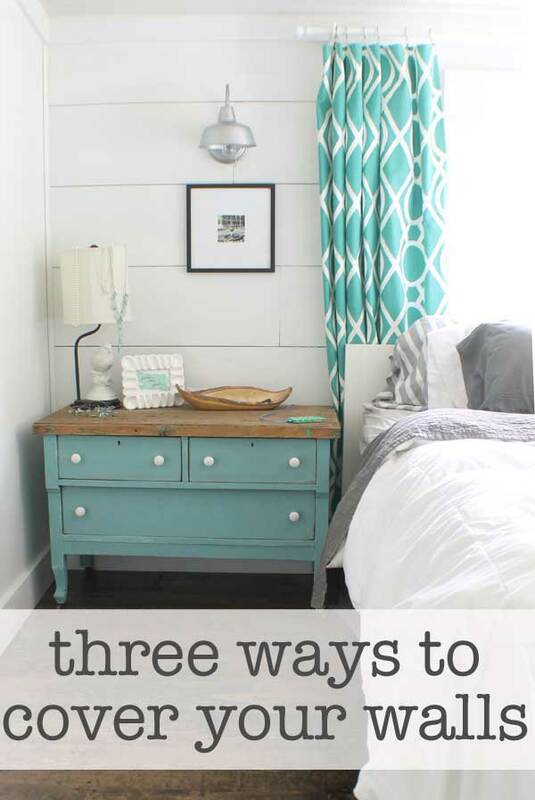 thanks for ways to spruce up mobile homes and make them interesting and bright!!! we used the corregated metal on our ceiling in the basement for a retro look! we love beadboard but it comes in 8 foot high sheets and our ceilings are 9 foot, i suppose you could use it and add 1 foot of metal ceiling tiles on the top or bottom? we plan to do one bedroom with dormers in horizontal planks. I know it’s been a while since this post, but just in case anybody else is in the same position now & looking for solutions…what about using a section of beadboard the height of a chair rail, another the height of chair rail to ceiling, and hiding the joint with a chair rail? That sounds like a great solution, love bead board!! Gina, I just found your blog. Btw Loving it! I have a question..I hope you didn’t already address this but what type of flooring do u have? Is it pine boards or pergo type floor..? I can’t quite tell. Thanks much! You’ve done an amazing job with your beautiful home! I like seeing what other’s have done. We’ve lived in two double wide mobile homes, in our 45 years of marriage. This last one, we’ve been in since 1986. We’ve done a lot of work inside. I saw something on HGTV where they were texturing the walls with drywall compound so I got busy and one summer, I did the living room and our master bedroom and painted the walls. Such a relief to get rid of that papered drywall! I hung paintable wallpaper in the dining room, and to lighten it, I left it white. In the kitchen we took the doors off of most of the upper cabinets and cut some decorative pieces to fit in the corners and now I don’t know if I could ever go back to closed cupboards! This past winter, we installed a woodstove in the corner of the living room, and used real bricks. It has made our home, so much more comfortable and attractive! And I LOVE the mantle. It was an old mantle from the house, I grew up in. My father had cut the Yew Wood tree down and had it planed, in the mid 1950’s. People are always amazed, when they step inside! Do I wish we had a stick built home? I used to lament that we didn’t. Now I don’t know as I want to move. We love our piece of the earth. We have 12 acres with a year round creek running right out our bedroom window and there’s no way, we would be able to find another place we so love. Plus, as other’s have said……..IT’S PAID FOR!!! You can dramatically cut the cost of the beadboard by using textured beadboard wallpaper. It looks just like the real thing! I tried wallpaper in the laundry room before, but over time mobile homes shift and where the cracks are it bubbles & wrinkles. It might work if you filled the cracks with caulk first? I don’t know. It is a great look, and it really does look just like beadboard – but a wood variety will hold up over time, plus gives you the sound proofing and insulation that wallpaper doesn’t. When moving from Va.to FL a few years ago we also purchased a Double Wide…we had just sold our home and I really wasn’t sure if a mobile was going to be an option…but after looking we decided to check them out….I wanted one that was as big as what we left and had plenty of storage that was a must…we found one it’s 72×80 2300 sq.ft. I really liked it except those ugly strips….they wanted a lot of $$$$ to mud and tape the walls so my husband did it himself and we repainted the walls….we also took the faux brick that was on the kitchen island down and replaced it with bead board…we also put it one of the baths half way up the way…looks really vintage….love the look of bead board……now I want my dining room done with it and a chair rail….we also have installed flooring in all the except bedrooms and family room…so it’s slowing coming together…thanks for the article I so enjoyed it and the ideas…. Finally some great ideas for mobile homes! I love your ideas. I recently removed a breakfast bar (there were two levels) and put bead board all around and it looks amazing and was so easy. It opened up the space as well. Love your home! It is beautiful. Thanks for sharing. Loved reading about your home and how you have transformed it! I have an old military built stick home that I keep making changes to, but hope to move when I retire. And I probably will buy a mobile home, so seeing what you have done makes me lean more toward buying one more and more. I love your website…I just purchased a 1978 double wide in Venice Florida. I am going to take the wall down between the kitchen and (huge) living room. The bead board look is just what I have been looking for. I just retired from the airlines and did not want a mortgage. I got the place for 1800.00 and I have a 20,000 budget so your website is giving me some wonderful ideas. Keep the blogs coming. I can’t believe how beautiful you make the interior of these trailers look! I just tried the metal siding option and it adds a tone of charterer and a unique look to a type of home that is often judged for its lack of originality. I love how your hair matches the fabrics and paint in your home,. Nice job with both. a woman after my own heart. Aqua…the most wonderful, peaceful, calming, serene color ever…and also my favorite! Wonderful article. We just bought 12 acres of land that has a single wide on it that needs gutting and re-doing so that is what we’re….doing. I am interested in all 3 of these ideas, and am wondering if you could describe the plank idea more, as I can’t tell how you did it or what with. Thanks! Love the metal trash can to complement the metal siding in the laundry room. Nice touch! Hey gina, where in the world did you get those curtains?!! I love them! Been looking for some just like that for a while for our bedroom. Thanks! Great job, looks amazing. I took the walls down to the frame of my 1961 Remington trailer. And remolded it from there. I added insulation and the drywall. Now it looks like a real wall. I’ve been following your blog for some time and love everything. I am thinking of buying a 1986 double-wide. Did you put the beadboard right on top of your walls? Or did you pull off the strips first? Did you try painting the paneling? I grew up with vinegar being a staple in my home too. My grandmother used it and my Mom and now I find myself using it often as well. I never tire of the smell because it's a very comforting to me. And it works on so many things..
How do pictures look hung on the beadboard or planks? I am wondering if the background is too busy for a picture. What about the ceilings? I see many mobile/modular homes on line where the ceilings have those seams. Any ideas on that? Your blog looks fantastic – definitely my style. I’m looking forward to browsing your site and getting your newsletter. As for the ceilings, I have seen folks finish their ceilings with planks and also beadboard, I guess it all depends on your budget, ha ha! Thanks for stopping by! I love this site and the work that you have done to make your home so beautiful. My family has lived in a double wide mobile home for 17 yrs now. My children are having a problem with it, because their friends have asked them why we don’t live in a real house. It is sad, because kids are so hurtful to each other sometimes. We own our own land and have our own water well. To buy a place like that in our location would cost a lot of money and our home and land are paid off. I try to tell my kids that they are blessed, because having a place as nice as ours to live and to be able to afford other enjoyable things in life is well worth it, but they don’t see it. Thank you for sharing these great ideas for improvement. I plan on checking into your suggestions. I will sign up for your newsletter. I love your site and love your tips and tricks we just remodeled our master bath last week on our staycation it turned out amazing and you inspire me truly!!! I am currently looking to make some bifold to fit into the linen closet and closet in that room with fabric or metal insets!!! Check out my short video on my page of how it turned out!!! Wow Cheryl! You inspire me, sounds like an awesome project! Hi Gina. I’m very interested in the bead board. I was just wondering though, do you take the ugly strips off the wall first or just bead board over them? Also, if you did take the strips off first, did you do anything to the wall before bead boarding? Hey Tammy, we just put it up right over the ugly strips, super easy and we love it!! Just wipe down the walls first to make sure they are clean. Awesome ideas! We just bought acerge with a mobile and modular home on it. The mobile is original 1970’s paneling and needs an entire interior update. I love these ideas! They are perfect for a rental! Gina, I have been a fan of yours for a while but I had no idea your home was a mobile home! ! (Wich to me is a huge compliment because you have no sighns of the typical mobile home characteristics) I was so excited to find that out as I also live in a mobile home. Ive been here for 2 1/2 years and I want to paint and update the whole home. The strips drive me crazy! Lol but as a single mom I’m so overwhelmed that I sit here and find great ideas and inspiration on Pinterest but I don’t know where to start. Do you have any advice to get my bum in gear? Lol One of my other pet peeves is the low ceilings in the bedrooms. Did you have this problem? Do you have any tips on how to update and decorate a room to make it feel less boxed in and taller? (Hope that makes sence) Thank you Gina your such an inspiration! ! Thanks so much Stacie! To get started just pick something small and go for it, once you see some progress it will give you both confidence and excitement to do more…you’ve got this!! Did you remove the strips on the walls? Good morning, I love your blog love all your ideas. We to live in a “ manufactured home” my walls are all tape and texture just like site built homes, no wall paper. We bought 5 acres 20 years ago and removed the old house and brought in our triple. Over the years we have done many projects right now we are doubling the size of our entry way. Adding a large porch and steps using pavers. Thank you so much for the great ideas I get from you, shiplap will be added this winter. Wow, I bet it is beautiful and I know you will be so happy with the Shiplap!! Good luck! Nope Gina, I had no idea you lived in a mobile. So beautiful. Wow you have a beautiful home! I am looking into purchasing a mobile home to renovate. Can you do bead board or shiplap walls in a mobile home that may be moved to another location after renovations? Can someone please give me some ideas! We own rental properties and recently bought a property with an older model trailer. The bathroom and kitchen has OLD BLUE‍♀️ wallpaper. I am scared to start taking it down, as I do not know what is underneath! Any CHEAP suggestions as to where to start and what to replace it with in a bathroom? This may be insane of me to even consider but I was wondering if anyone has ever added more windows to a mobile home? Our mobile home is 4 years old and on the best piece of land around, we have the most beautiful sunsets. We have looked at houses for about a year now but can never seem to bring ourselves to purchase because we love the land we are on. One of my biggest complaints though is the fact that our front living room wall only has a single window and it drives me insane. I want to be able to open my curtains, let the sun shine in and admire our country view. I was just curious if anyone has ever added windows and if so how much trouble are we talking? Thanks so much!! I have not and can’t tell you how big of a deal it is, you will probably need to contact a contractor to get an accurate proposal, but best of luck to you!! Do you know if I am able to put a subway tile backsplash over the gypsum/big walls in the kitchen of my manufactured home? You place looks great!